Some companies that Miller-Louden works with send her copies of her published product. “I’m like a kid at Christmas,” she says. Greeting cards have a funny way of making the impersonal feel personal. Someone, somewhere, writes verses for a card without you in mind. Then, by chance, you select that card from a shelf of others — presumably one of thousands just like it — and those words become your own. For 28 years, Sandra Miller-Louden has been the voice of those looking for words of humor, wryness, or sympathy. She has trained her brain to pick up on sound bytes in everyday life for fodder, just like a journalist or TV producer might do during an interview. There’s no room to mince words. 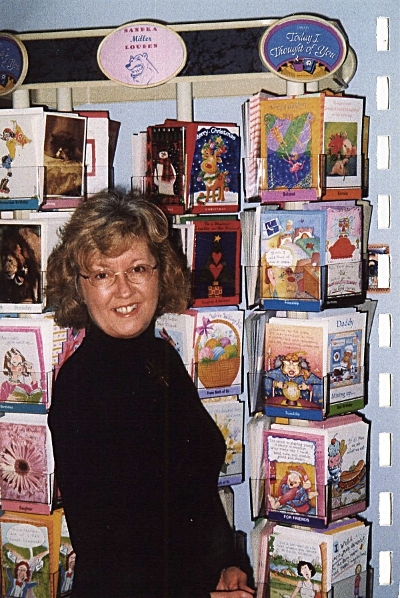 Now, in addition to writing verses for companies like American Greetings and Hallmark, Miller-Louden teaches greeting card writing courses, speaks at conferences, and has published a book on the subject. And despite the rise of birthday wishes in the form of e-cards and Facebook posts, there’s still a hungry, if niche, market for greeting card writers. After all, you can’t prop up an e-card atop your fireplace. Based in: The small town of Salisbury in Somerset County, Pa. Previous jobs: After graduating, I worked as a secretary during the day and played music at nights in my dad’s polka band. Then I got married, moved to Pittsburgh, had kids and wanted to stay at home. But after my second kid, I was going up the walls – I needed to do something creative. So I was flipping through a catalog called Current, which sold boxed greeting cards – and a light bulb went on in my head, like in the cartoons. But you didn’t have any prior experience. I wrote out a bunch of greeting card ideas on 3″ x 5” index cards and submitted them to Current, unsolicited. I got a rejection letter in return that said “very close, feel free to try again,” so I submitted a few every week. Your first idea that sold: A Halloween card. The front had a woman standing dressed as a maid with a feather duster and a badge that read “CGD.” Inside, it read, “Certified Ghost Duster.” I got $15 for that – $5 per word. I made a total of $115 in that first year. In a sentence or two, how do you spend your days? Right now, it’s mostly teaching. My greeting card work comes by assignment at this point; I usually have about two weeks to assign verses to photos. I work with about four or five companies, but it used to be a lot more – before they went out of business because of the Internet. How have you seen the industry change over the past several years, as more people are sending e-cards or simply wishing a happy birthday on a friend’s Facebook wall? That gives me pause. But midsize and large greeting card companies still exist – they just have to fight harder. During an interview in 2001, I was asked whether I thought e-cards would take over traditional paper cards. I said they can coexist peacefully, and I still believe that. E-cards are still largely really corny and animated, and you can’t save them forever. Do you also design the cards? No; a misconception is that greeting card writers must be able to draw. But it is important for the writers to think visually – it’s helpful to envision the art that might accompany your words. Where do you do your best thinking? Over the years, I’ve learned how to think. English has all kinds of expressions that are perfect for humor cards – clichés like “bent out of shape,” “cutting corners” and “hit the nail on the head.” I put a twist on them and add an occasion, which can be as nebulous as “just because” or female friendship. You’ll never see a man at the greeting card rack except the day before Mother’s Day or Christmas. I also always listen to children – my own and other people’s. One morning, my daughter was taking her Flintstones vitamin and I was taking my vitamin. She said, “I feel bad for you; your vitamins don’t look like anyone.” I made that into a birthday card. The outside said, “It’s no fun getting older: Our hair thins and our waistlines thicken.” The inside said, “And our vitamins don’t look like Fred Flintstone anymore.” I got $75 for that. You’ve written cards for: American Greetings, Hallmark and Gibson, plus a bunch of smaller places. All humor? That’s where I started. I’ve also done sympathy, rhyming verses, and alternative types, like cocktail napkin phrases. Average rate for freelancers: Between $50 and $125 per verse. Do you get credit, besides the satisfaction of seeing your work on shelves? We sometimes get credit on the backs of cards, but mostly, my words are anonymous. Artists and photographers, however, always get credit on the backs of cards. That doesn’t seem fair. Sometimes it makes me peeved. But while people may pick up a card for the artwork, they buy it because of the words. Best part of your job: My words become the sender’s words. When I realized that, it gave me goosebumps – the sender is truly adopting my words. Most challenging part of your job: You can get burned out with the funny stuff. Also, I’ve found a bit of snobbery toward me among other writers. Do you give family and friends your own birthday cards? Yes, I try to. Dream job in college: I wanted to be an actress. My father said I’d starve, so I went into English – just about one step up. Now, my dream job is being a bartender. I’m a darn good listener; I just need to learn how to make drinks. Think broadly, visually and literally. Don’t succumb to writers’ block. I don’t believe in it. When you’re really serious about writing, you can’t get the ideas out there fast enough. Some days you’re great, and some days you’re horrible. Top photo by Logan A. Louden; rest courtesy of Sandra Miller-Louden. You can visit Miller-Louden’s website here. Meet another No Joe Schmo who doesn’t mince words: The Saturday Night Live cue cards writer. 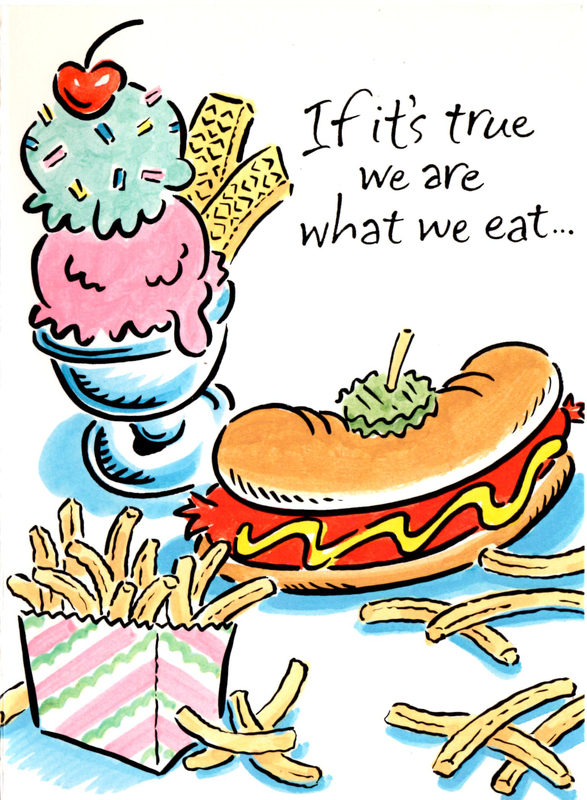 This entry was posted in Small Business, Uncategorized and tagged greeting cards, hallmark, writing by Megan Hess. Bookmark the permalink.